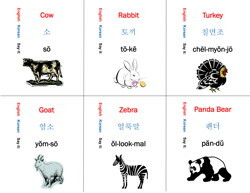 Learn 36 different animals in Korean now! 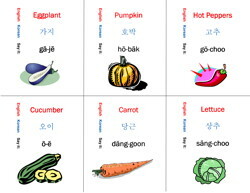 Each of these cards shows the english word, the phonetic pronunciation, and the Korean! Learn farm and wild animals. 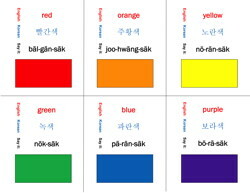 Learn 21 different color words in Korean now! Learn your basic color words! Learn 30 different food words in Korean now! 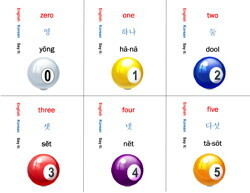 Learn 30 different numbers in Korean now! 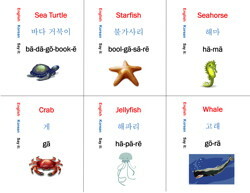 With these 30 cards, you can learn most numbers in Korean. They follow a pretty simple pattern, and don't have weird number names like the teens that we have. 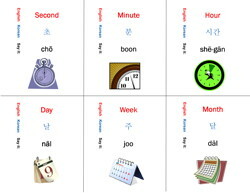 Learn 42 different time words in Korean now! Learn your seasons, days, months, and other time-related words! 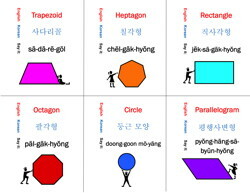 Learn 21 different time shapes in Korean now! Learn your basic shapes and 3D solids! 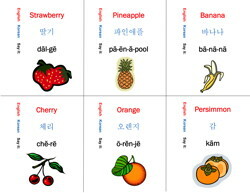 Learn 42 different food words in Korean now!